New studies from Harvard and Dartmouth researchers find that the SSA’s actuarial forecasts have been consistently overstating the financial health of the program’s trust funds since 2000. Researchers examined forecasts published in the annual trustees’ reports from 1978, when the reports began to consistently disclose projected financial indicators, until 2013. Then, they compared the forecasts the agency made on such variables as mortality and labor force participation rates to the actual observed data. Forecasts from trustees reports from 1978 to 2000 were roughly unbiased, researchers found. In that time, the administration made overestimates and underestimates, but the forecast errors appeared to be random in their direction. “After 2000, forecast errors became increasingly biased, and in the same direction. Trustees Reports after 2000 all overestimated the assets in the program and overestimated solvency of the Trust Funds,” wrote the researchers, who include Dartmouth professor Samir Soneji and Harvard doctoral candidate Konstantin Kashin. The Social Security and Medicare Trustee’s actuarial forecast from 2014 indicates that the Old Age and Survivors’ Insurance Trust Fund, which is more popularly known as the Social Security Trust Fund, was on track to run out of funds in 2033. 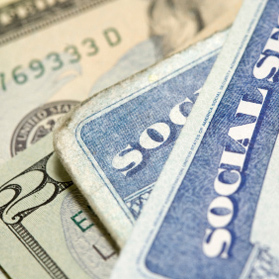 In fact, if you sign up to get your personal Social Security statement from the “My Social Security” government website, your statement will indicate that beginning in 2033, the amount of your monthly benefits that will be paid out through the rest of your life will be reduced to 77 percent of the value indicated. That’s something that will be a very big deal to every American who can reasonably expect to live past 2033, as many would perhaps find it difficult to have that portion of the income they are counting upon to sustain them in their retirement slashed by nearly 25 percent. Or actually now 2031, since the Harvard and Dartmouth researchers estimate the Social Security Trust Fund will more likely run out of money and move up the day of monthly benefit payment cuts some two years earlier than Social Security’s actuaries have forecast. As for what accounts for the discrepancy between their projections and those provided by Social Security’s Trustees, the researchers indicate that they believe the life expectancy estimates that the program’s actuaries are using to make their projections aren’t keeping up with how fact the actual life expectancy of Americans is increasing. Only in a bureaucracy can having more people live longer than what the bureaucrats expect be a bad thing.